When my friends told me that they wanted to go to Anawangin Cove - a Cove that is not known by most people (Even Filipinos don't seem to know bout it), I tried to look for it on the internet and found that its an isolated island without electricity or anything. Foreign tourists don't know bout it too - Probably because there is no mention of it in Lonely Planet! I wasn't very open to taking a holiday in such a place. I couldn't imagine myself in a place for two days without electricity, without signal on my cell-phone, without a roof over my head (You need to carry tents) and without restaurants! After days of slogging, my idea of a break was more about sitting in the spa of a huge resort and getting myself pampered. But then my friends persisted with the idea. What finally did get my buy-in was the fact that it would hardly cost any money to do this trip (It cost me about 1500 pesos - USD 30 for the whole trip). Stunning isn't it? A perfect cove with white sand - Now wait a second, that isn't sand! Basically that ain't sand but sediments (or something) from a volcanic eruption years ago! And that's true. It doesn't feel like Sand in anyway. Look closer and you would see pine trees on the beach. Now has anyone seen Pine trees growing on a beach? 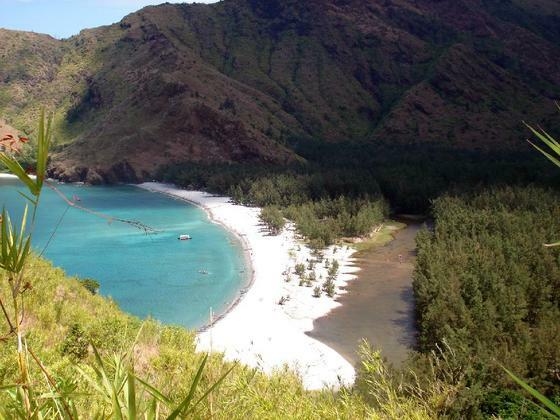 Apparently (not verified information), this is the only beach in the world with Pine Trees. Again, because that's not sand but stuff from the volcanic eruption! Along with the sediments, the eruption sent with it Pine Seeds and hence the trees. Take a cab or jeepney and go to Cubao Bus Terminus or Calocan bus terminal. The cab should cost about 100 pesos to Cubao and 200 pesos to Calocan. Simple and inexpensive isn't it? However, don't forget to pack a tent if you plan to stay overnight. Also, canned goods as there isn't any food there save for one small store selling Cup Noodles and eggs (Overpriced of course). Also, take a sleeping bag, or atleast a couple of sheets (bedspreads). Take some candles too as there's no light there (We didn't have to use them as the moonlight was bright enough and we lit a bonfire for most of the night). Also, of course - beachware and a beach volley ball if possible to play around. Shoes - if you are planning to trek around (Oh yes, instead of taking the boat to reach the cove, I was told that its also possible to trek there but that would take about 5 or 6 hours). We reached there and were amazed at how beautiful the place was. Just a small stretch of beach (Can walk the entire stretch in about ten minutes). We scouted around and found that the locals there had staked their claim to their bits of land by putting up boards in small stretches reading "Private Property"! They had these small fences.... Basically, you could set up tent in their area for a price of 100 pesos per person. This is worth it because they have a few toilets built there, bring you fresh water, clean up the place after you leave and basically help you out with whatever you need. We however chose to setup our tent in a secluded area and we didn't have to pay anyone for that. We would just pay them to use their toilets. We bought some firewood (they ask for about 100 pesos per bunch), went for a swim in the water. The water is calm but not as calm and clear as Boracay (I love the beach at Bora and that's always the benchmark for beaches in my vocabulary). 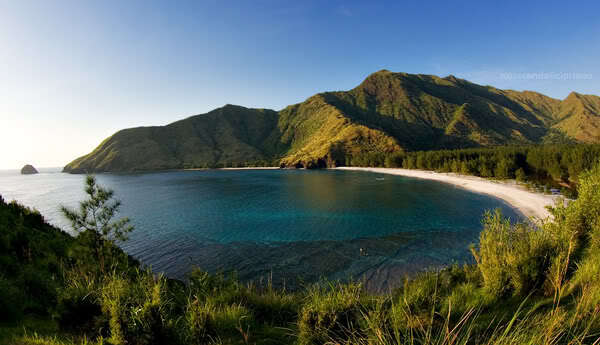 But this place is far better than Puerto Galeras (I've been there) and Bataan (My friends' had been there). We then sat by the beach and started talking around a bonfire. As we went further into the night, stories from the first day of school (The Asian Institute of Management - MBA) came out and it was fun reliving our 16 months in that one night! By the time, I fell asleep, it was about 3am in the morning! I slept on the beach instead of getting into the tent. It was pretty comfortable at night but I woke up feeling so damn cold (The sand gets so hot during the day and so cold during the night). So people, don't forget to carry a jacket and something to keep you warm at night. I woke up with a back ache and a cold! I went swimming in the beach again, we had fun eating out of the many cans that we bought (in the excitement, we had bought enough food to feed about 20 people - we were just 6 of us). I strongly recommend travelling to Anawangin to detox and go "offline" for a while! Leave your computer and mobile alone for a while! It is refreshing. Awesome! I too wish to go to some lonely place like that for a while for a break. It is beautiful dude...And a perfect place to detox!! I am ashame this is my hometown and don't know about it nor have been there.